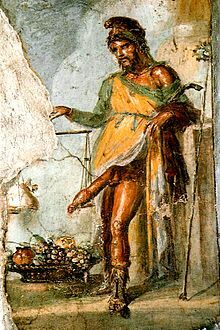 In Greek meethology, Priapus (/praɪˈeɪpəs/; Greek: Πρίαπος, Priapos) wis a minor rustic fertility god, pertector o fermstockin, fruit plants, gairdens an male genitalia. ↑ "Priapus". Collins Dictionary. n.d. Retrieved 24 September 2014.